Artist's illustration of the Puffin flying car, a concept vehicle developed by NASA aerospace engineer Mark Moore. Uber has hired Moore to work on the company's flying-car initiative, known as Uber Elevate. Uber has hired longtime NASA engineer Mark Moore to work on the rideshare company's flying-car project, according to Bloomberg Technology. Moore will become director of engineering for aviation and will help develop the Uber Elevate initiative, which envisions using "air taxis" to ferry people between "vertiports" located within 50 miles to 100 miles (80 to 100 kilometers) of each other, Bloomberg Technology reported Monday (Feb. 6). Moore has spent the last 30 years at NASA. 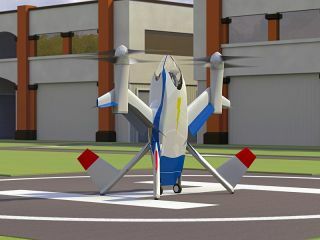 His research into vertical takeoff and landing (VTOL) craft — such as the electric Puffin concept vehicle — helped inspire Google co-founder Larry Page to start two flying-car companies, Zee.aero and Kitty Hawk, Bloomberg Technology reported. It won't be too long before we all move into the "Jetsons"-esque future such projects promise, according to Moore: He told Bloomberg Technology that he expects to see several different flying cars come online in the next one to three years. These vehicles will employ human pilots for the foreseeable future, Moore added. Read the full article on Bloomberg Technology.